E-Commerce is a platform where you deal with the customer thru your visual presence “Your Shopping Website” and do direct trading without sharing a word with the customer. So it is very import that website represent you in proper and organized manner. Visualization is very important to keep client on your shop and easy navigation, proper filtering are the key functions which gives customer ease to find product according to the requirement. Quality Picture with proper zoom and easy checkout gives you full chance to sale your product. 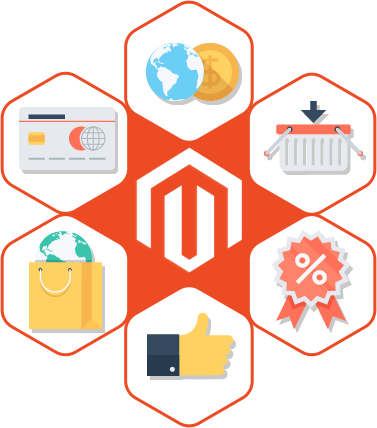 We create E-commerce website after complete understanding and analyzing your business model, Products, Target Customer. We don’t just give you a platform to upload a product, we provide you solution with proper training to manage control panel. We also offer Regular maintenance service which is very important in big shopping website. E-commerce could be Business to Business(B2B), Business to customer(B2C), Customer to Customer(C2C) like auctions and classifieds. We create all of them as per your requirement either it is single store, multi store, multiple currency, multi lingual, multi vendor etc.